Even if you can’t travel to San Antonio this year, you can “attend” the plenary and symposia on Saturday and Sunday using your PC or mobile device. And you can claim up to 15 CME credits for your participation. When the event nears, this page will be updated with instructions on how to join the Virtual Meeting via Adobe Connect. The link and instructions will also be emailed to you at that time. This is a "live" webcast. CME credit will be claimed based on particpation in the webcast. 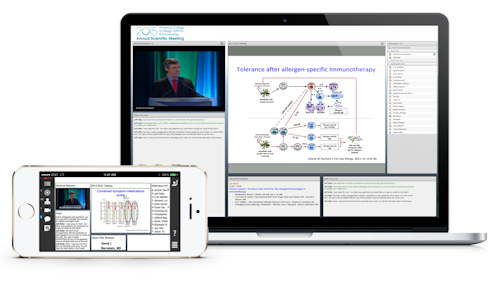 The American College of Allergy, Asthma & Immunology (ACAAI) designates this live activity for a maximum of 15 AMA PRA Category 1 Credit(s)TM. Physicians should claim only the credit commensurate with the extent of their participation in the activity. This activity is supported by independent educational grants from Merck and Teva Respiratory.